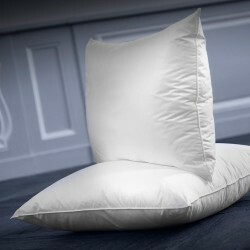 Discover our luxurious collection of soft synthetic pillows, and find at home the ideal nights of prestigious palaces, wich are clients of Dumas Paris since five generations. The soft synthetic pillow is perfect for people sleeping on the stomach. It offers exceptional comfort and an incomparable support. It allows to rest your cervical and lumbar region thanks to an optimal swelling. For people who want protection against mites, synthetic soft pillows can receive the exclusive GSD® process created by Dumas Paris: a double envelope with an anti-mite and anti-bacterial for maximum anti-allergy protection. Our soft synthetic pillows can be tailor-made and customized with your initials. Convenient when you have a large house and many beds ! Tailor-made and personalized pillows are not taken back or exchanged. This synthetic pillow will be able to receive the exclusive GSD® process: double envelope system which consists of adding an internal anti-mite lining.